Click on the image for a large version. Want an even better version for printing out? Contact me. Feel free to reuse or share this image under the Creative Commons Attribution license. We heard from Pamela MacDonald, Liako Dertilis, and Billy Dertilis of Red Rocket Coffee at today’s Small Business Network meetup at the Toronto Reference Library. They shared hard-won lessons from building a coffee shop business that now has three locations. 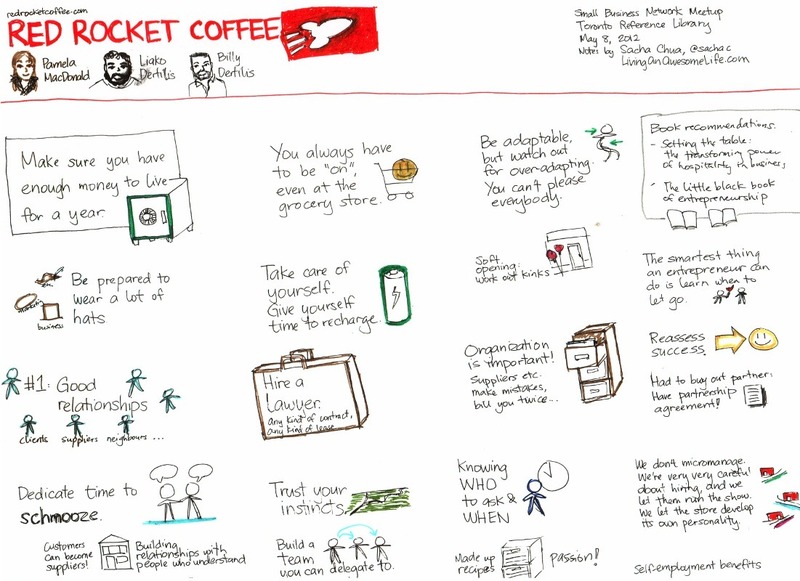 View more sketchnotes, read my notes about business, or browse around my blog! Make sure you have enough money to live for a year. You always have to be “on”, even at the grocery store. Be adaptable, but watch out for over-adapting. You can’t please everybody. Be prepared to wear a lot of hats. Take care of yourself. Give yourself time to recharge. The smartest thing an entrepreneur can do is learn when to let go. Had to buy out partner. Have partnership agreement! Build a team you can delegate to. We don’t micromanage. We’re very very careful about hiring, and we let them run the show. We let the store develop its own personality.